In Homer’s Odyssey, the Greek hero Odysseus stumbles across the land of the Lotus Eaters, a people so completely at bliss that everyone who sets foot there never wants to leave. For centuries, people have tried to find this mythical island without success. Perhaps until now. 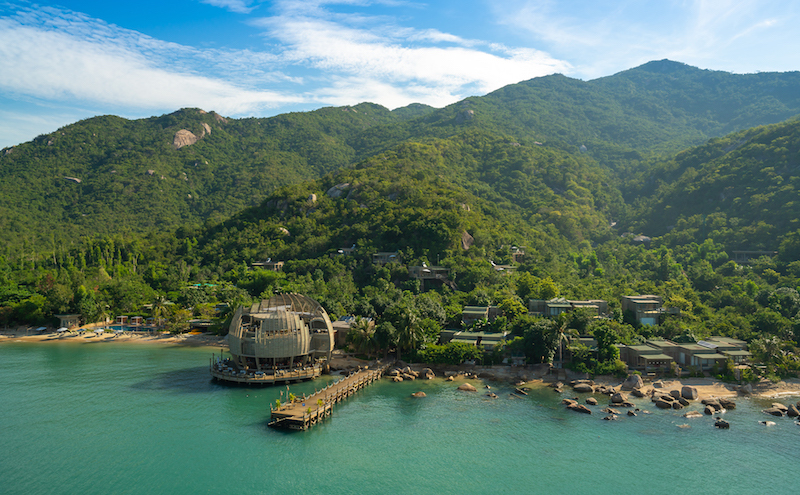 Two months after An Lam Retreats Ninh Van Bay’s grand opening at the end of June, we set out to see if this land of legend really exists. 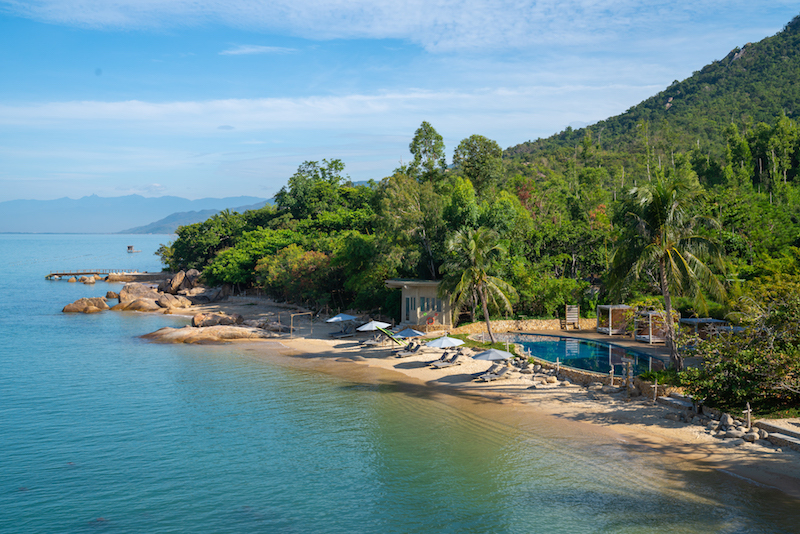 Our own odyssey begins with a seamless airport pick-up, driving along Nha Trang’s beautiful coastline 15km north of town to An Lam’s private jetty. A completely enclosed tender boat takes us on a smooth 15-minute ride over glassy seas, a flock of swifts flitting in the spray of our wake, towards the peninsula on stunning Ninh Van Bay. As we draw closer, the only sign of the 34-villa adults-only retreat is a giant wooden sphere, a modern interpretation of a lotus flower, a sign that we’ve arrived to the modern Land of the Lotus Eaters. Staff are lined up at the jetty to welcome us to paradise, a place so idyllic, it makes every slick marketing slogan ever written sound insincere. I’ve often wondered how Adam and Eve might have lived in the Garden of Eden, another earthly paradise. Might they have lived in a tree house, Tarzan and Jane-style? Or simply slept under the stars, cuddled by Mother Nature on a dense carpet of grass? Walking along the woody path up to our Treetop Pool Villa, past brightly colored lizards and butterflies, I think I have the answer to my question. 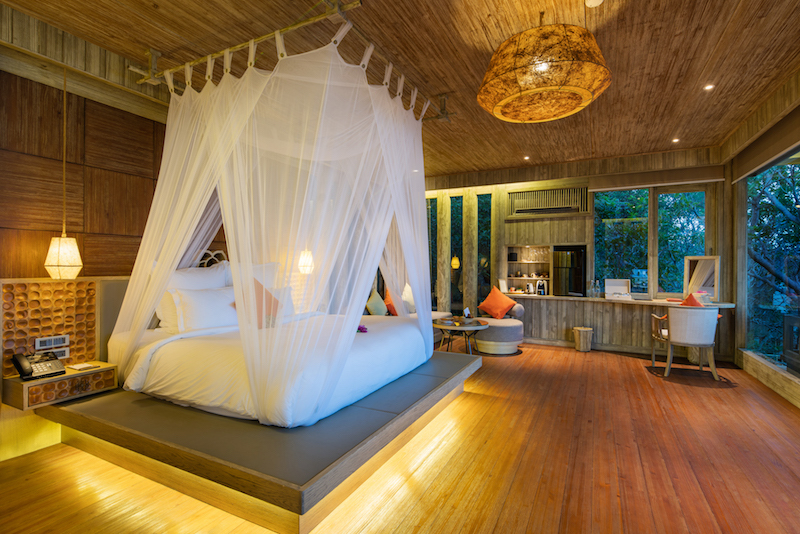 Set 12m above the ground, up three flights of stairs, our 75sqm tree house is jaw-droppingly stunning, as if Adam had a degree in Environmental Architecture and Eve majored in Interior Design. The largest of five villa types, the Treetop Pool Villa features two outdoor seating areas, a spacious bedroom with incredible, sweeping views over the bay, and an equally large bathroom with wooden bathtub, his-and-her sinks and a glazed turquoise-tiled rain shower with a sliding door opening directly onto a private plunge pool, all accented with New Zealand pine, appropriately distressed for a beach chic vibe. 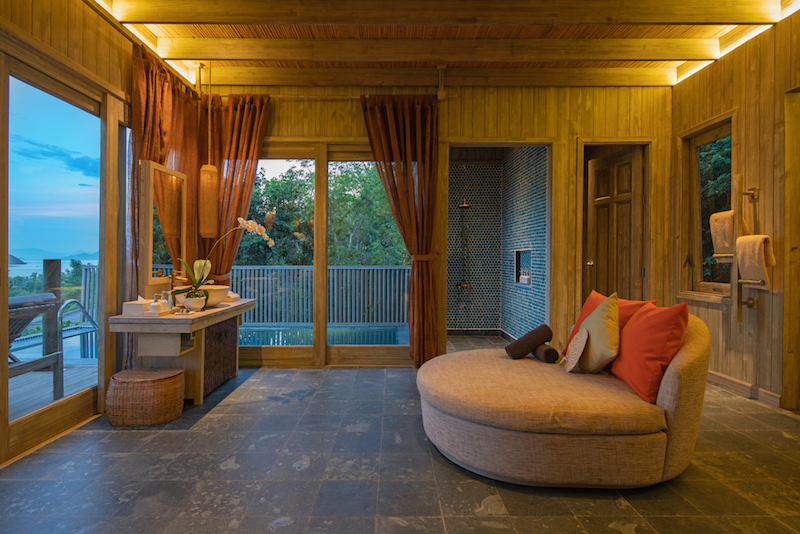 Natural materials give the villas an aura of lightness and brightness with stone and wood floors, polished bamboo accessories and gauzy curtains naturally dyed and hand-woven in northern Vietnam. While the uber luxurious nature of the villas themselves would fit right in to the pages of Architectural Digest, it’s the designing hand of Mother Nature that sets An Lam Retreats apart from all pretenders. Instead of seeking to tame nature, the retreat embraces its wild beauty. Built to merge seamlessly into the landscape, practically hidden amongst towering trees and giant boulders, each villa features ingenious sliding panels and windows which can be thrown open to allow the sea breezes in. The playlist to life in paradise is supplied by bird chirps, the hum of cicadas and the sound of water lapping against the crescent beach. The air is heavy with Mother Nature’s perfume, an intoxicatingly woody scent with sweet notes provided by jasmine flowers and cashew fruits bursting with their sugary, tart juice, just some of the many fruit trees on the property. The retreat is blessed with a natural mountain spring with its head some 10km up the mountain and double filtered for guest and resort use. One morning, we take a guided walk following the stream partway up the mountain, past the Jungle Gym, literally a state-of- the-art gym in the jungle, and the two private treatment salas of the Jungle Spa, recalling our earlier Swedish massage that took us further away from reality with every firm, tension-releasing stroke. We stroll along wooden walkways and scamper up large, smooth boulders into the jungle. Accessible only by boat, the peninsula is densely forested and largely uninhabited save for troops of langurs and other wildlife. We cool off in a swimming hole fed by the cool, clear stream, as panoramic views of the pristine bay unfold below us with Thi Island and its abandoned pagoda to the right, and Monkey Island closer to the mainland. 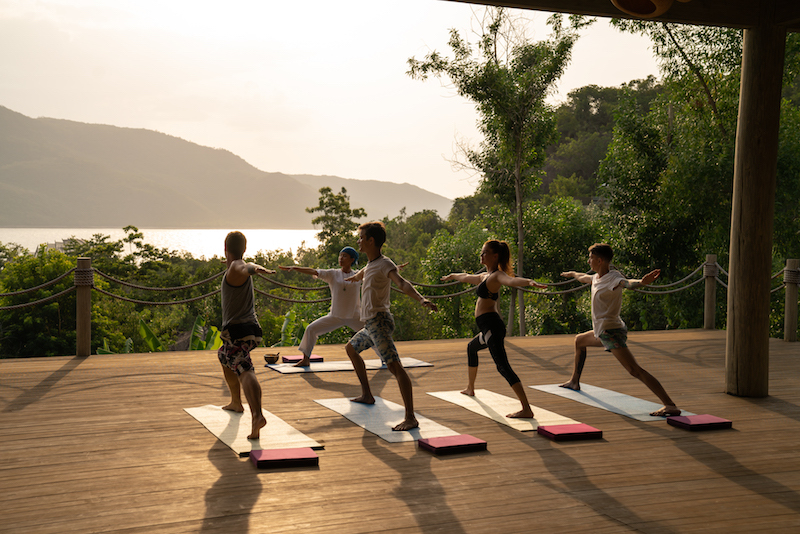 The retreat is similarly tranquil, with most of the other guests blissfully holed up in their villas, no doubt cooling off in the plunge pool, lounging on plush sofas or Instagramming with a #liveyourbestlife hashtag. Life at An Lam Retreats is all about privacy, and the staff, including dedicated butlers for each villa, know to be discreet, ringing a bell before delivering daily afternoon snacks and refreshments like passion fruit iced tea with a selection of petit fours to stave off the 4 o’clock nibbles. In fact, the rare times we see other guests are usually at the infinity pool, on the postcard-perfect beach fronting glassy, sea foam green water or at Sen Restaurant. Built over water, the spectacular open-air restaurant features plush, overstuffed sofas on the outdoor deck and tables inside with a show grill in the center, surrounded by massive timber pillars. The restaurant showcases classic Vietnamese cuisine with a handful of Western favorites, immaculately presented. One lunch, we have the Australian Tenderloin, beautifully seared with an earthy mushroom sauce and served over a bed of mashed potatoes and steamed vegetables with a smear of sweet berry reduction balanced by the tartness of balsamic caramelized onions. However, it’s in the treatment of fresh seafood where the restaurant truly shines. Thanks to carefully cultivated relationships with some of the nearby floating fish and lobster farms, the seafood on offer is second-to-none and guests are even invited to visit the floating farms via 5-minute boat ride to select their own seafood. One evening, after sundowners at the rooftop bar with 360-degree views of the bay and the hazy blue mountains beyond, we order the Nha Trang Seafood Platter with grilled sea bass, tiger prawns and squid served with a small heap of herbs and veggies from the retreat’s own organic garden and a flavorsome green chili dipping sauce. It’s followed by Lobster with Garlic Butter, grilled to perfection, and a whole grilled pomfret, its firm meat ideal for rolling in rice paper with fresh veggies, all dipped in a thick, Vietnamese dipping sauce. With the lights of the mainland glittering like a string of Christmas lights in the distance and the gentle sound of waves lapping the shore, there’s no place else we’d rather be. It’s appropriate that in this halcyon Land of the Lotus Eaters, An Lam Retreat’s logo is a lotus flower in full bloom. 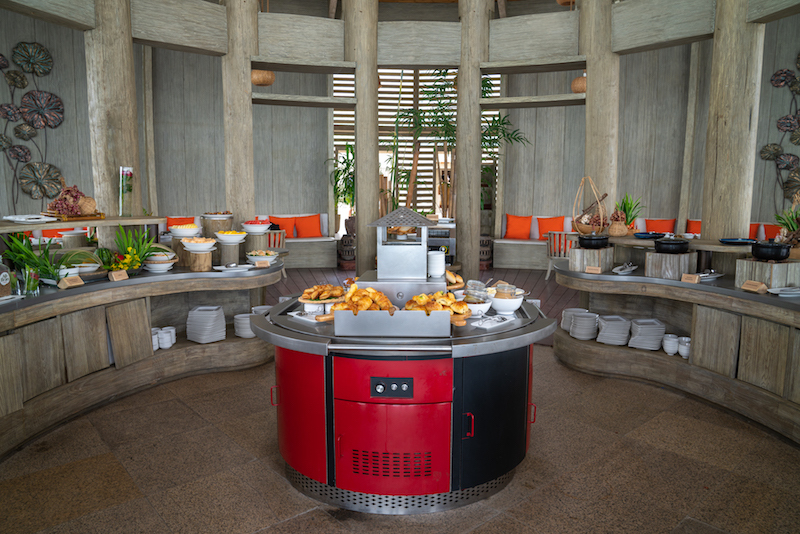 It’s subtly incorporated into the design of the resort—in drawer pulls and tabletops and in the contemporary shape of Sen Restaurant. Iconic of Vietnam, An Lam’s lotus proudly represents a homegrown Vietnamese brand achieving a level of luxury previously seen only at international-level properties, but here wholly Vietnamese owned, designed and operated. As with Odysseus’ men on the mythical island of the Lotus Eaters, we can barely tear ourselves away from An Lam when the time comes. Even as the boat idles on the jetty, we sip the last drop of our frothy Vietnamese iced coffee and freshly baked breads, a last nibble of the intoxicating lotus in this very real version of earthly paradise. 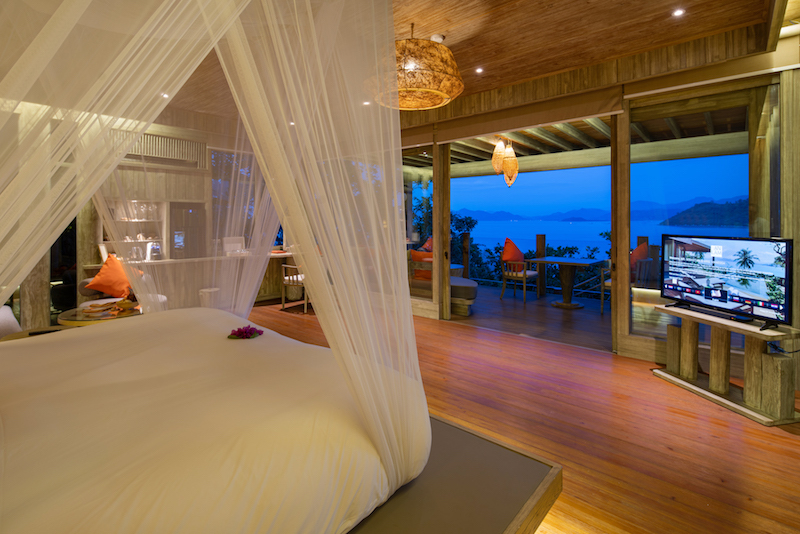 An Lam Retreats Ninh Van Bay is an adults-only resort. For more, visit www.anlam.com.